Patricia DeOrio a proud graduate of the Howard County Public School System, and attended Waterloo Elementary, Mayfield Middle, and Long Reach High School. Mrs. De Orio began playing the piano at the age of 6 and the violin at the age of 8. She began teaching in Howard County in the fall of 2005, upon completion of her undergraduate degree. In the 2015-2016 school year Mrs. De Orio began her tenure at Forest Ridge ES. She has previously taught at Gorman Crossing ES, Jeffers Hill ES, Swansfield ES, Triadelphia Ridge ES, and Glenwood MS.
Mrs. De Orio completed her Bachelor’s degree in Music Education from Converse College in Spartanburg, South Carolina in 2005, and her Masters degree in Music Education from the University of Maryland-College Park in December 2009. She achieved her National Board Certification in November 2011. 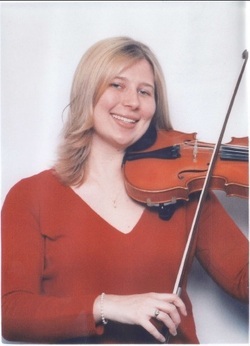 In June 2014 Mrs. De Orio published her research on accommodating and modifying instruction for students with disabilities in the strings classroom, Teaching Students with Disabilities: A Resource Guide for the Strings Classroom. Mrs. De Orio is a member of MENC (The National Association for Music Education) and ASTA (the American Strings Teacher's Association) and attends as well as presents at their conferences annually. Mrs. De Orio will be presented her research from her book at multiple MMEA and ASTA conferences, including the 2015 MMEA conference in Baltimore MD.